It’s great that you’ve found us! Please take a look around the site to see who we are, where we meet and how you can join! 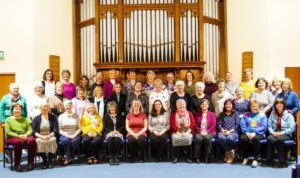 We are now in rehearsal for various concerts we have been invite to provide to various local organisations around the area plus our regular Summer Concert which will be on Saturday 13th July 2019 – please put the date in your diary and come along to enjoy a great evenings entertainment. We are now working under the directorship of Anne-Marie Kerr and Fiona Weakley and looking forward to working with them over this coming year. See Who’s Who for more details.